This guide should cover everything you need to know to properly rip vinyl records to your computer. In the no compromise spirit of loseless and vinyl ripping in general, I've outlined a setup that I think is the minimum for making worthwhile vinyl rips. It's surely possible to do it with much lesser gear, but the quality will not be of the level we expect. If you're getting into vinyl ripping, please do so with adequate hardware, nobody is going to be happy downloading a 1GB torrent to find that the quality isn't as good as it should be. The whole point of downloading a vinyl rip is for the potential quality it offers, so don't skimp on the gear or the process - ripping vinyl takes time, care, and equipment. It's not like ripping a CD at all. Read this tutorial in full and understand it. Before we get into details, just a quick lesson on how the technology works and what the major components are. Records are recorded by cutting a small groove into a vinyl or acetate disk. The groove is modulated with the audio signal so that its depth and shape records the sound signal itself. During playback, the disk sits on the platter, which is the motor-driven spinning component and spins at a constant rate. Several rates were used, with the most common being 33-1/3 RPM (for 12" LP records) and 45 RPM (for 7" singles). While the disk spins, the stylus (or needle) which is housed in the cartridge rests in the groove. Holding the cartridge and stylus against the record is the tonearm that swings from a pivot as the stylus moves across the record, and has a counterweight to balance the force of the stylus on the record. As the stylus vibrates due to the groove's contours, coils in the cartridge convert the movement to an electrical signal. The electrical signal is of a very low strength, and must be amplified before it's sent to an amplifier or recording device. This task is handled by a dedicated phono preamp (or an integrated one in the speaker amplifier), which also performs another critical task - equalization. Due to the mechanical constraints of the record medium, both low and high frequencies are much quieter on the record than they should be at playback. A special equalization filter must be applied to restore the correct tonal balance; this task is performed by the phono preamp at the same time it is amplifying the signal to a usable level. This signal is then taken into a standard line input and amplified for playback, or recorded. I will discuss the turntable and cartridge/stylus separately here, as they are generally purchased separately. Chances are good that you'll need to purchase at least 3 components - a turntable, cartridge and phono preamp, so I'll spend the most time talking about these. If you need to buy all three, you should budget for at a bare minimum $200 expense (and a lot of time). If you need a quality sound card as well, budget another $100. Turntable quality is often assumed to be of little importance. All it does is spin the record, right? Unfortunately for us, that's not really true. What a record player does is convert physical vibration (of the needle in the groove) to an electrical signal that can drive an amplifier. The problems arise from the fact that the groove might not be the only thing vibrating the stylus - motors and mechanical instability can be huge noise culprits. Furthermore, frequency stability in the motor is extremely important to reduce wow and flutter. You can check this using the strobe built in to most higher-end turntables. Most turntables will have a dot or dash pattern around the outside of the platter. Many also include a built-in strobe, which flashes at a particular frequency. By looking at the dot pattern while the platter is moving with the strobe on, you should see the dots (usually one row for each speed) 'frozen' in place by the strobe. Any movement or wavering indicates an unstable speed. If you're buying a new turntable, I would recommend looking on the used market for a belt driven model constructed mainly of wood or metal (plastic vibrates much more easily). Some direct drive models are good too, but others are horrible - if you're looking at one of these, be careful. Consistently good brands include Dual, AR, Thorens, Linn and others. Aim for models that were top of the line in their day. Also avoid any with a 'linear tracking' mechanism as these require additional tuning and have many problems. You can identify these types as they don't have a tonearm, the cartridge assembly moves on a tube across the record. This is a place where you really need to research your options and put in the care to get a good turntable. Most of the stuff out there is going to be crap, and you need to sort through it and find the rare gems to get decent quality. Especially with belt-drive and idler-based turntables you may need to replace belts or idler wheels to get stable rotation speeds. Check this before purchase, or expect to invest in the maintenance if buying online. If you can't find anyone praising it on forums and so on, don't buy it. Because of the difficulty with finding and getting a good vintage turntable tuned up, you may want to consider the new (or less-used) market. Price goes up to $300-400 for a new quality turntable. Look at options like the Pro-Ject Debut III and Rega P1 and P2. These will often include a quality cartridge. Spend $75-100 on the used market, though the sky's the limit. Choosing a cartridge is largely a matter of personal preference, but there are some important considerations. First, you should replace any cartridge that you don't know the history of, they are easily damaged and do wear out with use and over time, so if you buy a used turntable you should buy a new cartridge as well. Several types of cartridge are available. 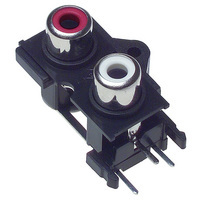 Most cartridges are of the moving magnet type, and these are also the least expensive. If you're reading this guide, this is the type you should buy. Beware that there are two common mounting methods used for cartridges. The P mount has a rear section that fits inside the tonearm, while the standard (1/2 inch) mount screws onto the underside of the tonearm. Make sure you get the right type, or a universal type. Good brands include Grado, Ortofon, Audio Technica and others. Choosing a specific model can be particular about the exact properties of your turntable and tonearm, so I would advise asking at a Hi-Fi audio shop or audio forum for advice. The most commonly recommended cartridge I've seen is the Grado Black, which is relatively inexpensive and readily available. Audio Technica AT95 is also often recommended and is somewhat less expensive. Spend $50-75. Don't buy used. You may have one already, if you've got a receiver/amplifier with a phono input. The quality may not be the best, but it would certainly be usable. If you've got such a unit, connect the turntable to it and switch the input to 'phono'. It should have a 'tape monitor' or 'preamplifier' output that you can use to record from. I do not recommend this option if you can avoid it though, most receivers have cheap, poor sounding and noisy phono preamps. If you're buying, there are lots of options. The used market is a good place to look, try to find reviews by audio magazines or on audio forums for ones you're considering. Excellent new phono preamps can be had for quite a small amount of money, so that is the route I recommend. The TCC TC-760LC is widely regarded as a good deal - it's only about $75 and reportedly sounds good. Another good option is the Cambridge Audio Azur 540P, also well regarded and available for under $100. For a few more dollars the Hagtech Bugle seems to be universally loved, at $150 (with no case or power supply). If you've got some electronics savvy and would consider a DIY solution, the RJM Audio VSPS is a good choice and can be built for next to nothing, the Phonoclone at the same site is also excellent, as is the DIY version of the Bugle. Expect to spend $75-100 on the new market, or $25-75 on the used market. You'll need a good quality sound card capable of 96KHz/24bit or 192KHz/24bit capture. Aim for a device with good analog specifications. Unfortunately onboard audio devices don't meet this requirement, you'll definitely need a separate sound card to get a decent quality capture. If you've already got a Creative X-Fi model card, it will suffice, but I can't recommend these for anyone purchasing a new one. If you've got a PC with a PCI slot available, I recommend the e-mu 0404PCI or e-mu 1212m (about the same price, the 1212m is much better if you can get it), or the M-Audio Audiophile 192. If you can't find these, the M-Audio Audiophile 2496 is an excellent card as well, though it doesn't support 192KHz operation and doesn't have as impressive specifications. Finally, if you need multichannel or a more entertainment oriented card, the Asus Xonar DX2 is probably a good choice. If you'd like an external unit, I can recommend the e-mu 0404USB or e-mu 0202USB. For Firewire, the M-Audio Firewire Solo is fairly well regarded. Going with external will cost you extra and probably sacrifice some quality too (at this price range), so I'd go with internal if you can. Spend $100-150 new for an internal, $200-250 for an external. You'll also need interconnects, to hook all of this up. You'll need at least one stereo RCA cable to connect the turntable to your preamp (though many turntables have this attached), as well as the correct cable to connect the RCA jacks on your preamp to your sound card. There are three common jacks used on sound cards, and you'll need to get the correct type for your card. Consult the following descriptions to determine what type of cable you need. 3.5mm (1/8") 'Mini' jacks are common on consumer gear, and are the type most people are familiar with. They carry both stereo audio signals on the same connector. The same type is used on iPods and other portable devices, and most headphones today use this type of plug. I don't have a good photo of an example, but most people should be familiar with these. The necessary cable is readily available. Don't waste your money on overpriced cables. You shouldn't spend more than $10 on a 6ft cable, so don't let anyone sell you more expensive ones (such as Monster Cable), they are NOT worth the money. I recommend you buy your RCA cables from Monoprice. The quality is good, the service good, and the prices (and shipping) excellent. Their RCA->mini cables are of dubious quality though, and they don't sell RCA->TS cables either. I'll link to what I recommend for each, though they're very non critical and similar examples can be found at most retailers. Don't try to use the XLR inputs on your professional soundcard, as these are designed for microphone use and won't work properly with your phono preamp. Most any PC should work fine for this. You'll need lots of disk space (you should have a minimum of 10GB free before attempting a capture), but the performance requirements are not particularly high. USB will use the most processing power, and has the most risk of audio dropouts. Properly tuning a turntable is a difficult and fairly important bit of maintenance you really should do for the device that probably hasn't seen use in 20 years and likely has a brand new cartridge. I would really recommend taking your turntable to a qualified professional and paying for a proper tuneup, but as always it is possible to do yourself. Improperly adjusting your turntable can damage your records and accelerate wear, as well as affecting audio quality, so please recognize the risks. It's also very helpful to have some fairly expensive tools at your disposal. I won't go into detail on this process here, but you can find a reasonable guide at this site. It's also important that the turntable is on the most level and stable surface as possible. Any vibrations that transfer to the tonearm or platter will show up in the recording, so try to place the turntable in the most stable place you can. Your signal chain should be fairly obvious. You will need to connect components such that the signal goes from Turntable -> Phono Preamp -> PC. In most cases this will be simple to achieve, but I will give a few pointers. If you're using a receiver or integrated amplifier as your phono preamp, it probably has a 'tape monitor' or 'preamp' output. You should use this output to connect to your PC, but you may need to enable the tape monitor feature on the amplifier as well. On professional sound cards, the inputs are often not labeled specifically for left or right; generally you would connect the left (white/black) channel to the first input and right to the second. On consumer level cards there is often a mic input as well as a line input. Use the line input only, the mic input is not appropriate for this use. I recommend using Audacity as your capture software. It's simple and fairly foolproof, and free open source software. If you'd prefer, there are many suitable applications such as Adobe Audition. This guide was written against Audacity 1.2.6. 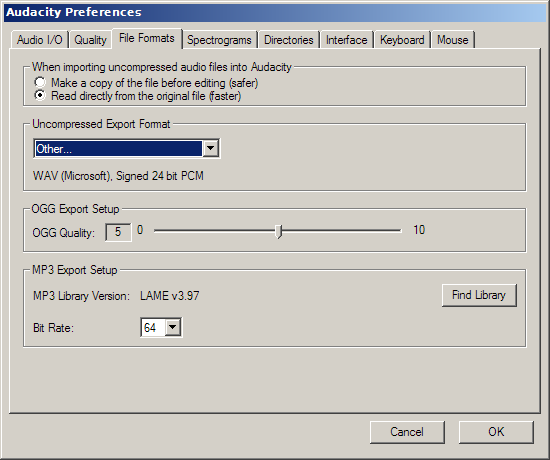 First we will configure Audacity for 24/96KHz capture with the correct audio device. On this tab, make sure the correct capture device is selected under 'Recording', the brand and model should be listed here. You might also want to change the Playback device so you can monitor the recording, the default 'Microsoft Sound Mapper - Output' device will play back to your normal windows sound device. Choose 'Software Playthrough' if you'd like to monitor the output while recording. On this tab, follow the settings in the screenshot below. If your sound card is capable of it, you may select 'Other' for the Default Sample Rate, and type 192000 in the box for 192KHz capture. On this tab, you must select 'Other' for the 'Uncompressed Export Format' option; this will give you a box to choose the encoding. Select WAV and 'Singed 24bit PCM' for the encoding. The other options don't matter for this guide. If you need Audacity to use a different hard drive during capture, you can change it here. Restart Audacity after making these changes. 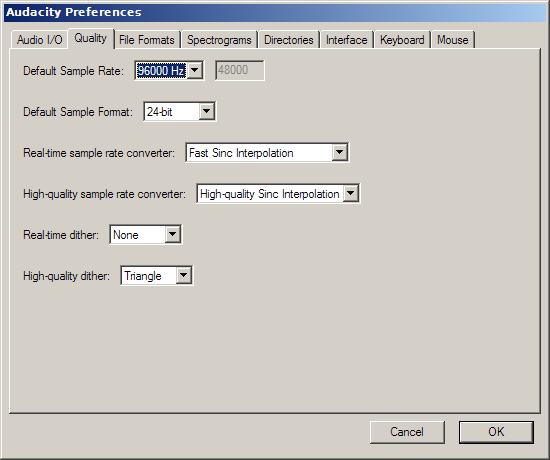 You will also need to configure your sound card itself for the desired sample rate. Usually this is accomplished through a driver control panel for your sound card. It should match the setting you set in Audacity. If you have an option for 'Internal' or 'External' clock (Master/Slave is a term also used, you want Master), you want to choose Internal here. It is a good idea to purchase a quality record cleaner and clean your records just before capturing them, and to use the dust cover on your turntable. Even the smallest speck of dust will be audible in a recording; the less dust the better. I don't have any specific recommendations here, but I highly recommend you do some research and purchase a good cleaner. Also, if at all possible, use records that haven't been played much and that have no visible scratches. Wear is a problem as the vinyl is only good for a certain number of plays before it starts to wear down affecting the quality. Obvious scratches will cause lots of loud pops that are difficult to remove nicely and obviously ruin quality. If you don't have a record in good condition, it's not worth the trouble of recording it. We will first be making a test recording to set levels and make sure everything is working properly, so get everything set up, turned on, and put your record on the turntable. Get it fired up and playing. To start recording, press the record button in Audacity (red circle), and you should see the waveform being recorded as well as the VU meters at the top jumping around. Now we need to set the levels to ensure there isn't any clipping. The screenshot below shows what the VU meter looks like during recording, with a properly adjusted level (though a bit low). You should aim for peaks reaching about 75% of the maximum level (the peaks are represented on the VU meter with an extra line showing the highest the signal's been in recent time). Try to play the loudest part of the record while you adjust to make sure it's not going to start clipping halfway through and force you to rerecord. How you actually adjust the levels depends on the sound card you have. Most external cards will have a knob attached to each input that adjusts the level (as well as an LED-based VU meter) - the best setting for these is at their maximum, minimum or at any spot where there's a detent, as long as this puts the signal at a proper level. It's difficult to match them otherwise between the left and right channels, and the balance of the recording might be off if you adjust them. If you've got an internal card, the driver control panel should provide a level adjustment slider for the inputs. Make you're not just adjusting the output or one of the S/PDIF channels as they can sometimes be confusing. You want to make sure the 'stereo link' is enabled to adjust the channels at the same time. Most drivers will show a VU meter on this panel as well which you can use in addition to the Audacity VU meter. The level itself is not critical, but it should be at least 50% of the maximum and should never approach 100% at any time. Once you've got the levels set, stop the Audacity recording and listen to the few minutes of audio you should've recorded. Make sure it sounds good (don't worry if it sounds a bit quiet) and listen for any audio dropouts (there shouldn't be any). Finally! Everything is set up and it's time to capture a side. This part is easy. Create a new project in Audacity and discard your old test one. Stop your turntable. Now we're ready to start, so press record (red circle) in Audacity and then start the turntable and place the needle in the lead-in area. You shouldn't listen while recording, as the vibrations from speakers can be a contributor to distortion, though if you'd like to monitor on headphones I recommend this. Once the side is complete, stop Audacity and the turntable. We'll do a side at a time in the guide, once you're done one side, go back and repeat from the Capture step. The first thing we're going to do after capturing the audio is to split it into tracks and proof it for quality. Just start playing the audio from the very beginning. When you reach the start of the first track, stop playback and move the playhead (just click in the waveform window) to just before this point. You'll have to use your judgement where to place the track break. Press Ctrl-B (or Project->Add Label At Selection) to create a new label. Your cursor will be in the 'title' for the label at this point, so just start typing the name of the song. Once you've got the label made, press play again and make sure you've got the label in the correct spot and also listen to the track for any problems. Continue for all the other tracks on the side. Once you've got labels created and properly positioned for all the tracks, we will amplify the signal to a normal level. Select the entire waveform (Ctrl-A or Edit->Select->All) and then choose Effect->Amplify. This will automatically set itself for 0dB maximum output, which is close to what we want. If you see the Amplification (dB) box shows 0.0, you have clipped the input during recording and you'll need to do it over with a lower level. Otherwise, type -0.1 into the 'New Peak Amplitude' box and press OK. It may take a moment, and you should see the waveform become larger. Now we'll export to WAV files for encoding. Choose File->Export Multiple... and the following dialog appears. 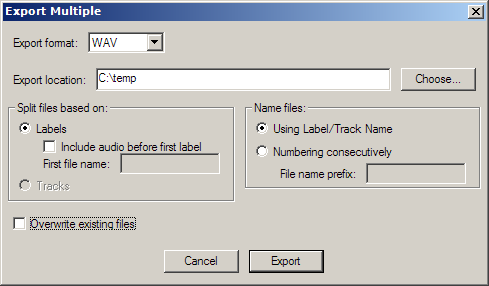 Note that unless you check the box and type a name in the box, audio before the first label will be lost - so make sure you labeled the first track. Okay, the title says 'Complete', but this is one thing I'm not going to go into here. It involves removing clicks and pops, and possibly noise. The problem is that if you've followed the steps up until now, you should have a good quality recording with little noise and rumble that would be easily removed by an automated script. You will need to go through the recording by hand and remove each individual random click or pop. This can be done in Audacity by selecting the problem area and choosing Effect->Click Removal... You can find more detail on this technique at the Audacity wiki. I do not recommend using the noise removal plugin as many other guides recommend. If you've followed the equipment guidelines and have a reasonable quality setup, the constant noise should be very low. This plugin is not appropriate for removing small vinyl noise which is almost impossible to get rid of. If you've cleaned the record well and the recording is still noisy and fully of pops, chances are that the record itself is just in poor condition and not worth capturing. Please just remove problem clicks and pops as necessary, and try to apply as little processing as possible to your recording. If you choose to apply post processing, do it before the 'Amplify' step in the previous section. I thought i would share with you guyz a couple of tips and tricks for vinyl ripping. I've seen a couple of post here and there with people saying they couldnt rip their vinyl properly and so on. I'm not trying to be smarter than anyone here, just sharing a couple of things i've learnt by ripping vinyls myself over the years. Anyone having some vinyl, and doing some vinyl ripping should do it with a direct-drive turntable, like a technics sl-1200 mk2. Because if you dont use this kind of turntable, the pitch isnt 100% stable, and you'll be recording vinyls with some tiny variations in pitch. And therefore, when you'll use the files to mix on cd (for instance), the tempo wont be stable. So please use direct drive turntables ! Forget these turntable-to-usb thing : crappy. About needles and cartridges : obviously, you shouldnt record vinyl with old needles. Change it as often as possible, thats to say when you notice the sound gets worst. Everyone has his own reference cartridge / needle. I record with shure white label. While i know it doesnt give a flat sound, it does bring you more treble and bass than other cartridges. But these are expensive and fragile. Avoid ortofon, imho, they tend to cut the high frequencies too much. The key is the phono amp. Unless you have an expensive soundcard with a good phono amp (like the RME Rpm, definitely the best solution for vinyl ripping... but expensive, this is some professional soundcard. http://www.rme-audio.de/en_products_hdsp_rpm.php), you'll have to get a good phono amp between your turntable and your soundcard's line input . Avoid toys and cheap amps, they'll give you crap sound. Avoid turntables-to-usb solutions, this is the crappiest thing you'll get to do serious vinyl ripping (bad turntable, bad analog to digital converting). Some good turntable and not too expensive phono amp will do the trick. Once again, please avoid these 'ripp your vinyl collection' packs. These hardwares/softwares are crap. Avoid any Anti-Crackles/Anti-Pop/Vinyl Restauration option/plugins. They ruin the sound. Better have a wavefile with some crackling, than a wavefile with some weird plugin artifact. Basically, if you're on PC i would advise using soundforge, or audacity. There's also wavosaurus, which is good and free. On mac, i guess peak is the best pro-audio software. if you're ripping old vinyls, make sure to clean them as much as possible before recording them. Water is the key. Don't be afraid to wash your vinyls with soap/dish soap, and a looooot of water. Beware the label. Dry them with a very sweet gaze. If you still hear some crackles and pops when playing, i know some people use this trick : anti-dust spray on the record, like o cedar spray. Never done it, but i know it works. I personally dont use this trick, because i record my old vinyl with water on it : while the vinyl is playing, i drop some water, not too much, but enough so that the needle is always bathing in a little bit of water (not too much, or you'll ruin your turntable, you fool !!). It drastically improves the sound : much more treble, and much less (and sometimes no more) crackling. Try it, you'll be very, very surprised ! After recording, dry your vinyl with some gaze. Ok, i think thats it. Hope that helps. If you have questions, pm me.